In light of the fact that our new President will be exceptionally experienced in General Aviation and aviation at large, we thought it might be appropriate to take a look at Mr. Trump’s now familiar large corporate Jet, his $100,000,000 private Boeing 757-200. Although the President-Elect may no longer travel in his beloved 757 once in the White House, but rather the much larger 747 Air Force One, a peek into Mr. Trump’s 757 typical operation, in the videos that follow, might tell us something about his outlook towards the entire aviation industry, including General Aviation. Keep in mind, also, that, in addition to his being a very active user of General Aviation by way of his private fleet of two helicopters and two corporate jets, the President-Elect once also owned his own Airline, the former Eastern Airline Shuttle, which became Trump Shuttle, once he had acquired it. While Mr. Trump’s 757 is costly to fly, at about $15,000 per hour, Air Force One, on the other hand, makes that expense seem almost meager, since it costs almost $206,000 per flight hour to operate the much larger two-deck Boeing 747. While it is certainly far too early to make any meaningful predictions on what sort of effect Mr. Trump’s change of address may have on General Aviation, he has made it clear that he intends to do all he can to make our military as strong as it once was. This may mean that he intends to put an end to the Sequestration program that has so significantly cut into all branches of the service, particularly noticeable insofar as it severely curtailed participation in such traditional public aviation activities as Air Shows by both the Air Force Thunderbirds and the Navy’s Blue Angels exhibition teams. 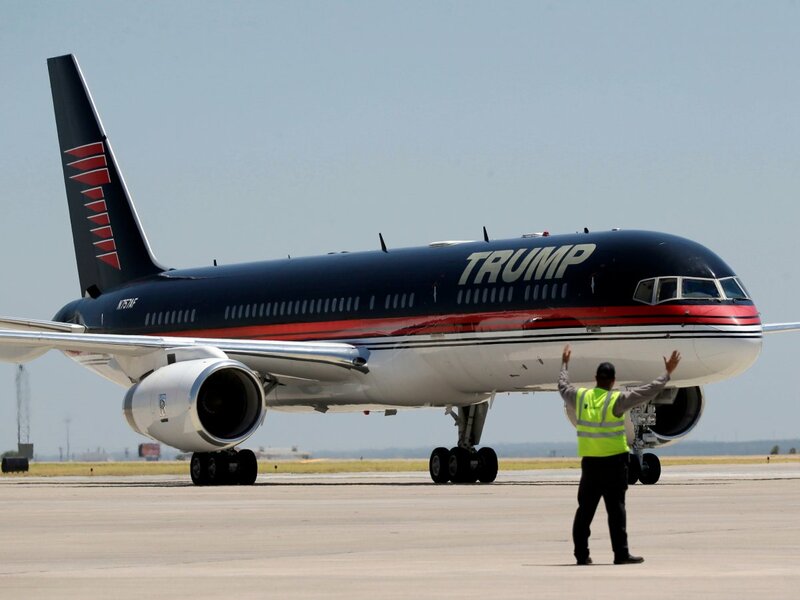 In the meantime, let’s move one to the topic at hand, Mr. Trump’s now famous Boeing 757 private jet airliner. John Dunkin is Captain and Chief Pilot of the Trump Boeing 757-200 Corporate Jet. Mr. Dunkin has been flying for Mr. Trump since 1989. His father, a military pilot, began teaching John to fly at only 15. He could actually fly before he could drive. John’s current job is far from comparable to that of one of today’s talented airline pilots, because his duties include far more than just piloting the aircraft, and this following second and longer video will make that fact clear. John’s second in command, or co-pilot, is Larry Brian. In a commercial configuration the Trump Boeing could carry as many as 239 passengers, if it were filled with economy seats, but there’s nothing “economy” about this ship. Trump’s 757 is designed to carry only 43 luxury passengers secured with 24 carat gold plated seat belts, according to the video tour of the aircraft (the first and shorter video below) his company posted online in 2011. It features a dining room, big screen TVs, a master and a guest bedroom and even a shower. 757s have a top speed of 609 miles an hour can fly up to 4,400 miles without stopping, according to Boeing. It is nearly 125 feet wide (wing tip to wing tip) and more than 155 feet long. It weighs in at 255,000 pounds or 127 Tons. Donald J. Trump has a net worth of anywhere from $4,000,000,000 to $10,000,000,000, depending on fluctuating real estate and other investment valuations. His Boeing 757 is part of his air fleet, which also includes a Cessna Citation X jet and three Sikorsky Jet S-76B helicopters. Take flight on one of the most luxurious private jets in the world by viewing the second video below . . . and one of the biggest of all corporate jets. Trump’s Boeing 757 is three times the size of the average private jet – and much faster. Tour of Trump’s 757 [3:31 Long] The Apprentice’s Amanda Miller gives a tour of Mr. Trump’s 757. This entry was posted in AVIATION NEWS on November 20, 2016 by FASFRIC.